Who are the faithful of St. George? The Saint George Church of Trumbull that we see today had its roots with the turn-of-­the-nineteenth-century Albanian immigrants coming to the Bridgeport region. They began a legacy that is carried on by today's parishioners, who look fondly on their house of worship. “It's a great place to share my faith with my 'family members and other people 'I've known my whole life," says Danielle Masek. "I also enjoy being a member of the choir." Teaching Sunday school is also agreeable, Danielle says, because: "I enjoy sharing my faith with the younger generations who are part of our church." Her mother, Karen Masek, has been a choir director since she was 16. Why does she like Saint George's? "Because it's such a family community," Karen Masek says. "Everybody somehow has a nice connection with each other." That sentiment echoes from parishioners of all ages. "I have very warm memories of a close-knit family in addition to the religious aspects," says Gloria Athanas, another lifelong parishioner. "Your parents all knew each other. Their parents crossed over the ocean with each other. The religion is what kept them together, and the customs." Explaining why the church is so important to the parishioners, the V. Father Sergei Bouteneff, the pastor, notes that by the early 20th century, at the time the community was forming, Albania had already been conquered and under foreign occupation for almost four centuries. "It was in America for the first time in centuries that the liturgy, the worship of the community, was conducted in their own language. So the church became the center of their political and social aspirations." Among the first Albanian immigrants to arrive in southern Connecticut were Charles James (Sotir Gjercheku), who settled in Southport around 1890, and Thoma Katundi, who came to New Haven about the same time. While it is hard for us to picture now, at that time Charles James peddled fruit and vegetables from a horse-drawn wagon in the Southport and Greenfield Hill areas. During the first decade of the 20th century, Albanians from Korce settled in the area. Like other Albanian immigrants at that time, they came without their families, seeking to establish themselves financially before sending for their wives and children. During the 1920s, the community grew as the wives and children arrived. By the end of the decade, there were about fifty Albanian families in the area. Visionaries of their day, the immigrants of this fledgling Albanian-American community understood the need for a spiritual home, one that could speak to their minds, their hearts, and their souls. Thus, in Bridgeport, the first Orthodox Church services in the Albanian language were organized. They were to begin with Palm Sunday, April 12, 1925. A hope was now made real. We were organized, but not yet established. For that first service, Louis Theodos, and his friends, organized "The Saint Thomas Albanian Church Society of Bridgeport, Connecticut," and arranged for an Albanian-speaking priest to come from Ansonia and to conduct the services of Palm Sunday, Holy Week, and Pascha. These services were held in the chapel of Saint John Episcopal Church located at Park and Fairfield Avenues. The organizing committee consisted of Louis Theodos, president; James Vani, vice-president; Philip Cotmil, treasurer; and James Tallcouch, secretary. However, as there was no Albanian bishop in the country at the time, it was another ten years before a church could be organized and consecrated. The response to these services made clear the need to continue preparations for a parish church. This was no easy task. In 1929 another step was taken. Thomas L. Tallcouch and a group of friends organized an Albanian-American men's social club, which they named "Ylli" (The star). Membership increased rapidly until it reached over a hundred. The club sponsored picnics and plays and raised money for the future church. The ladies of our community were not idle. Between 1928 and 1930, many wives of the original settlers arrived from Albania. Often they were homesick, missing the relatives and loved ones they had left behind, and lonely as their husbands had to work long hours away from home. The same Thomas L. Tallcouch, who formed the Ylli, organized the Queen Teuta Ladies Society in 1931. The Teuta Ladies Society satisfied a deeply felt need for social interaction and provided the opportunity to share concerns and experiences. The first meeting was held at the home of Cornelia Soter in January, 1932. The hostess prepared a delicious byrek for the occasion. [This dish, sometimes referred to as lakror in our community, continues to be the piece de resistance of our parish hospitality.] The first executive committee consisted of Cornelia Soter (president), Dhora Polena (vice-president), Beatrice Tallcouch (secretary), Kaliroi Dionis (treasurer) and Emilia Stephan (trustee). These two societies formed the nucleus of the future church. The Teuta Ladies Society has always been at the heart of all church activities, sponsoring numerous social and religious affairs. Their continued contributions have been a blessing to us all. Ten years of sacrificial struggle only provided an irregular church life. This would change as a result of events that occurred during the mid 1930s. In 1933-34, Ikonom (Archpriest) At (Father) Vasil Mandi arrived in Bridgeport with his wife and family. Father Vasil was assigned to serve as associate pastor at a local Greek Orthodox Church. On January 1, 1935, a group of his Albanian friends gathered to celebrate his name day. Father Vasil expressed the hope that they would soon have a church of their own and offered to serve there without compensation. His generous offer was greeted with such enthusiasm that a committee consisting of Father Vasil, Philip Cotmil and Charles Demetri was immediately organized to find a place to hold Paschal services. Philip Cotmil contacted a local banker with whom he had business dealings, who offered the use of the hall on the second floor of the Staples Bank, rent-free, for as long as it might be needed. Under Father Mandi's direction, Mr. Cotmil and Mr. Demetri, who were as handy at carpentry as they were at business, transformed the hall into an Orthodox place of worship. The hall was packed with worshipers for the Holy Week services. The cantors were Trifun Mandi, John (Argir) Lazar and Steve Tallcouch. The "Saint Thomas Albanian Orthodox Church of Bridgeport" was here to stay. Louis Theodos, who had helped many of the Albanian immigrants get started in business, now directed his zeal, experience and organizing abilities to the formation of a permanent church. Louis Theodos presided over the first committee that included Theodore Dionis, Peter Atanas, Philip Cotmil, Charles Demetri, Costa Vangel, George Polena, Peter Tallcouch, James Vani and Costa Jordhamo. Father Vasil Mandi was installed as the first permanent pastor. He was then seventy-two years of age! The church moved twice during the next few of years. Initially it was located on the third floor of a building at 286 Fairfield Avenue. Metropolitan Fan S. Noli held a Hierarchical Divine Liturgy there. Then on May 16, 1937, Saint Peter's Roman Catholic Church on Howard Avenue was purchased for $7,500.00, a goodly sum in those days. This was to be the new home of the parish for over forty years. By the time the Howard Avenue Church was consecrated by Metropolitan Fan Noli on September 5, 1938, the mortgage had been paid and the parish was free of debt. It was consecrated as Saint George Church, renamed after George Dionis who was the highest donor. At the consecration, Metropolitan Noli was assisted by Fr. Vasil Mandi (the first pastor), Fr. Sotir Tollkuchi (the second pastor), Fr. Alexander Veniaminoff of Holy Ghost Russian Orthodox Church, Fr. Jacob Grigoriev of Three Saints Russian Orthodox Church of Ansonia, Archimandrite Elia Lafloufe of Saint George Antiochian Orthodox Church of Danbury, Fr. Lambi Floqi (Michael) of Southbridge, Fr. Nicholas Prifti of Philadelphia, and Archimandrite Thimi Theodos of Worcester. Col. Luke Bakoota of Holy Ghost Church directed the choir for the liturgy of consecration. The Pan-Orthodox nature of this consecration reflected Metropolitan Fan Noli’s vision for the future of the Faith in America. It was this vision that set the parish’s destiny. Our own choir was organized later that same year (1938) under the guidance of Father Grigoriev. Metropolitan Noli, who was a great lover of Russian church music, set Albanian and English words to the traditional Russian chants and compositions of the great masters. Thus the musical style of Saint George evolved. Our first choir director was Ilo Kovachi, an accomplished musician who collaborated closely with Metropolitan Noli. Over the years the following have directed the choir: Mary Costa Wilan, Dorothy Kovachi Sementilli (Ilo Kovachi's daughter), Steven C. Tallcouch (who later became our senior cantor), Karen Michael Masek, Evelyn Leka Kreta, Laura Bowe Chadwick and Lisa Tasi. Van Michael now serves as cantor, teaching others to assist in that same capacity. Father Sotir Tollkuchi, who first assisted Fr. Vasil, served as pastor from 1937 to 1946. During his pastorate a Sunday school was organized. It has been staffed, as it still is, by willing volunteer teachers, who pass the treasures of Orthodoxy to new generations. Their long hours of selfless labor strengthen our church. Father Christo Costa was pastor from 1946 to 1950. Father Alexander Kovachi, who succeeded him, served the parish for seventeen years from 1950 until his death in 1967. These were difficult years for the Albanian churches. The new communist regime in Albania launched a vigorous religious persecution that first brought the Church under strict government control and finally almost eliminated it altogether (at least forced it “underground˜). The Patriarchate of Constantinople, who refused to recognize the new Albanian regime, decreed that all Albanian dioceses were now subject directly to the Patriarchate. Some people supported this solution; others were firmly opposed. As far as we were concerned, the Albanian Orthodox Archdiocese in America, like so many other churches of Eastern European origin located in America, became de jure, if not de facto, independent. The canonical crisis intensified when Metropolitan Fan S. Noli, the leader of Albanian-American Orthodoxy since 1908, died in 1965. The Church found itself without a head at the very time when it needed one the most. Father Alexander Kovachi had the difficult task of guiding the parish through these stormy days. The struggle on the Archdiocesan level had its repercussions locally. The parish was further weakened by the deaths of some of its benefactors and strongest supporters. On the other hand, providentially, George K. and Alexandra Polena willed their four-family home to the church and thus enabled the parish to purchase the lot and house on Main Street in Trumbull, which was to become the site for our future church. The construction of a new church proved to be much more difficult than had been anticipated. In 1968, the parish purchased the Gorman estate in Trumbull. It consisted of some three acres and a fine old Victorian house, one of the town's better-known landmarks but in poor condition, as it had been vacant for several years. The following year the project encountered serious difficulties. Some local residents went to court to prevent the building of a church on that land. The case dragged on for over eight years. Meanwhile, in 1970, the Russian Orthodox Church, which had sent the first Orthodox missionaries to this country in 1794 and had ordained Fan Noli in 1908, in an effort to end the canonical crisis caused by the communist regimes granted full independence (autocephaly) to the Russian-American Metropolia. Parishes of other canonical Orthodox jurisdictions were offered the opportunity to become part of this new national church. The following year, delegates at the Albanian Archdiocese Convention in Boston voted unanimously to join the new Autocephalous Orthodox Church in America. With this decisive step, under the leadership of Bishop Stephen (Lasko), our Archdiocese and our parish were able to put past canonical problems aside and turn to the future. The priest who followed Father Kovachi as our pastor was Father Stephen Barham. He was the first permanent non-Albanian priest to serve our community (1967 to 1971). It was during his tenure that the liturgy began to be celebrated in the English language on a regular basis. Also during this time, people in the parish were seriously talking about building a new church. With this goal in mind, Don Jordan took the initiative of uniting the men of the church into a viable force. He invited a group of men considered to be leaders in the church to join with him in this venture. Thus, the Saint George Men's League was formed. That first group consisted of Nick Adam, Vincent Theodos, Paul Thanas, Steve Tallcouch, Richard Nichio and Richard Taylor, with Father Barham as the spiritual advisor. Membership soon expanded and over the years the Men's League raised nearly $70,000 for the new church through a variety of activities, both financial and social. Once the new church was built and the mortgage paid off, the Men's League disbanded. Father Eugene Vansuch was installed as pastor in 1971. A graduate of Saint Vladimir's Seminary, he was well qualified to reorganize the choir, the Sunday School and other church organizations. To this day the choir continues to sing from the books that Father Eugene re-organized and also to sing a capella. During this period, parishioners worked hard to repair the Victorian house for use as the rectory and to develop plans for the new church building. Even as our legal case was winding its way through the courts, in 1973, a Building Committee -- Ligor Buzi (Chairman), Nicholas Adam, Harry Jordhamo, John Liolin, and Donald Tait -- was formed, charged with constructing a church on the lot. Peter Dionis and Van Michael were put in charge of fund-raising. In 1976 Father Daniel B. Montgomery, former military chaplain and chairman of the foreign language department of Valley Forge Military Academy in Pennsylvania, became our pastor. He was a soft-spoken, gentle man who served our parish for 11 years. During his ministry, the community became more united and determined to face whatever challenges faced us in court. In May of 1977, while the case regarding the use of the land was still in court, the parish took a daring step. The old church building on Howard Avenue was sold. For nearly two years after that, services were held on a regular basis at the Saint John the Baptist Church (Silver Lane) in Stratford. 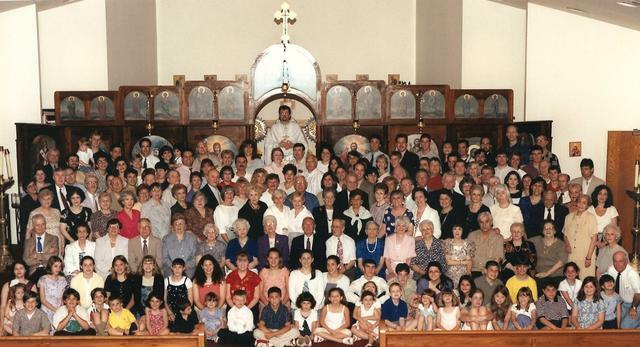 On those special occasions when we needed more room, Saint Dimitrie Romanian Orthodox Church in Bridgeport, our friends from our "Korce past," generously offered the use of its facilities. In the words of the psalms: "How good it is when brothers dwell in unity." How blessed we felt for the support of these Orthodox brothers and sisters. The court case, begun in 1969, was finally dismissed by the State Supreme Court later that same year (1977). We were finally free to put our plans into action! Before the start of Great Lent in 1979 the church, while not yet complete, was ready for use. In September of that year, we hosted the Archdiocesan Convention downstairs while workers were installing the pews upstairs for services the next day. Metropolitan Theodosius presided at the Hierarchical Divine Liturgy. As a temporary measure, the iconostasis was taken intact from the old church, but the pews and stained glass windows were new. For example, Joe Chadwick, was introduced to the church, got to know the community and started establishing a bond when he was dating his wife Laura, who was an active parishioner. After they married, he converted­. "It really has a nice family atmosphere," he says. "I really admired the closeness of the community, as well as the fact the service itself is beautiful." Van Michael, the cantor, has been a parishioner and choir member since 1955, the son of an Albanian Orthodox priest, Michael says, "Now as we're getting more and more non-­Albanians, we've continued to maintain our closeness and fellowship and we're still committed to improving the church and the life of the church." His special memories include not only his marriage to wife Diana and their children's baptisms, but the marriage of their daughter and many others. “As a member of the church choir, I take great pleasure in participating in the ceremonies and singing during their weddings," he says. In the late 1980s, Father Stephen Siniari arrived with youthful and dedicated zeal. Although he was with us only a brief time (1987 to 1989), his ministry had a significant impact and made a lasting impression on the younger members of our parish. His good humor enabled him to easily establish a rapport with the teenagers and young adults of our church. Our current pastor, Fr. Sergei Bouteneff, was appointed to the community in 1989. Through his ministry our faithful were invited to become more active in the prayer life of the church, while at the same time putting that prayer life into practical, social action. Saint George's has gone from being inwardly directed, to outwardly directed in terms of budget and service to the community, says Father Bouteneff. "We're trying to show we're more responsive and responsible in who we are as a Faith Group." Several events that prompted outreach. One was the Special Olympics held in New Haven years ago. When the church heard a group of individuals came from Albania with nothing, "our community came' together and made uniforms and got the stuff they needed to compete," he says. "It was wonderful and inspirational." Having provided for the team’s material needs, many of the faithful received them into their own homes, giving them a sense of home and connectedness. With the fall of communism in Albania, the church got the opportunity to send the country massive amounts of aid. “The church collected more than 30 tons of goods for orphanages, old age homes, churches, and those in need,” Father Bouteneff says. That's a lesson John Louis, one of the senior-most parishioners, explains about Saint George. "What you hear is always good things, what people in the past have gone through," says Louis, "and it reminds you to follow the good things in life and makes you want to help as many people as you can." The large and active Church (Sunday) School and the dynamic, multi-generational choir (from age 7 to 70), assures that these “good things” can continue with a solid base. As Gloria Athanas, Teuta Ladies Society President, explains, "When you have a small church I think all these blend together - the choir, church school, the parish council, the ladies society. We become one when preparing and planning for a Holy day, a function." In 1995, for the 75th anniversary, the church commissioned a series of icons, 17 of which are now in place. On one side, they represent major feast days of Jesus Christ, including the Nativity, Presentation in the Temple, and Baptism. On the other side, the icons depict major events in the life of Mary, from her Nativity to her Dormition. They're displayed chronologically in the order of their celebration on the church calendar. Across the rear wall depicted are the events before and after the Resurrection, including the Crucifixion and Pentecost. One icon brings together saints associated with the Albanian Orthodox Church and the Orthodox Church in America: On one side of the central cross are Albanian saints like the Apostle Paul (who founded communities in Illyria, which is present day Albania) and Angelina of Serbia (an Albanian noble woman who married a Serbia prince). On the other side of the cross are Orthodox saints in America: the teenaged Peter the Aleut, a martyr, Saint Herman of Alaska, and Bishop Raphael of Brooklyn (who was of Syro-Lebanese origin) among the churches depicted in the background is the Albanian Orthodox Cathedral in Boston. "The icon represents who we are," says Father Bouteneff, "people of various ethnic backgrounds committed to America: bring Orthodoxy to America, and America to Orthodoxy." Won’t you join us in this mission?